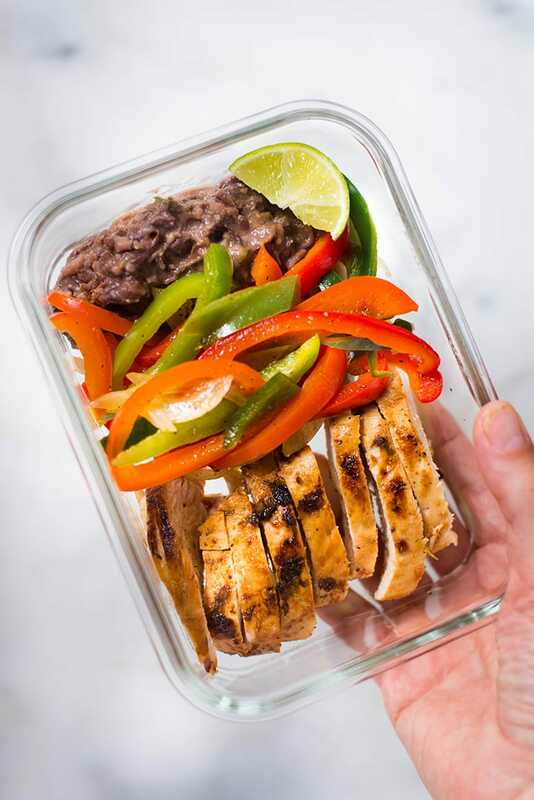 This Healthy Chicken Fajitas Meal Prep includes healthy chicken fajitas with fresh fajita veggies and the most amazing spicy black beans. 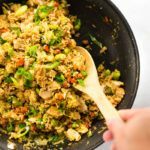 This is a low carb, high protein, and high fiber meal prep you’re gonna love. Bonus: this chicken meal prep is just 455 calories and is a great meal prep on a budget since each serving costs just $3.37! We eat a lot of fajitas. And absolutely LOVE them. It’s one of the rare meals that Dustin and I both very much enjoy when ordering at restaurants. Unfortunately, most chicken fajitas are loaded in added oil and salt, and then wrapped in refined flour tortillas. Plus: I don’t want to go out to dinner every time the fajita craving hits. Because it hits a lot. 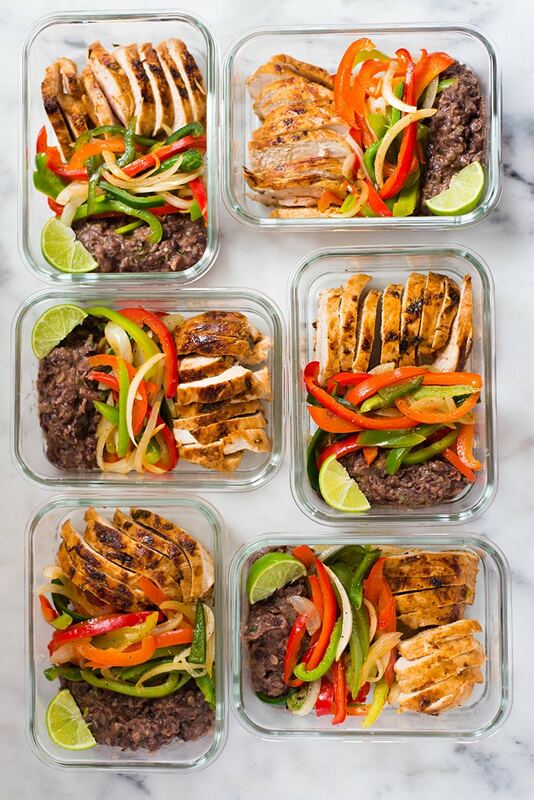 Enter Meal Prep Healthy Chicken Fajitas. 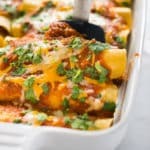 I especially love that I can make one of our favorite dishes ahead of time and then just grab it from the fridge and have a home cooked, delicious, and healthy dinner or lunch served in a matter of minutes. If you’re new to meal prep, these Healthy Chicken Fajitas are a great recipe to get you started. I mean, you are having FAJITAS for dinner. Meal prep really helped me get on the healthy, clean eating path. 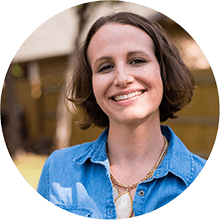 Planning just makes everything so much easier, especially when you’re just starting out. 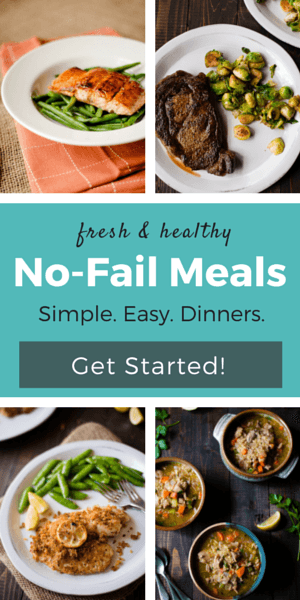 Follow my easy step-by-step Meal Prep Healthy Chicken Fajitas recipe and learn how to meal prep like a pro. Chicken is definitely one of the healthiest and easiest options for protein when meal prepping. I mean…you really can’t go wrong with chicken. 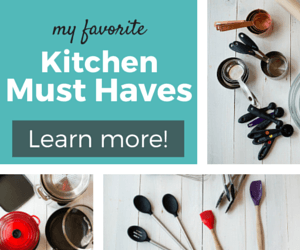 It’s simple to season, fairly quick to cook, and it’s good for you! If you’re planning to meal prep chicken, the first thing to do is to choose a recipe that’s good for meal prep. These Healthy Chicken Fajitas are a great one, believe me. When meal prepping chicken, it’s crucial not to skip the first and the most important step – marinate. Marinating the chicken breasts for at least a half an hour makes so much of a difference. Your chicken will be even more flavorful, juicy, and moist! I also recommend that you cook your chicken breasts whole and THEN dice it when storing it, instead of cutting it up in bite-sized pieces before cooking. This helps keep so much of the juices inside and keeps the chicken from overcooking. Game changer. You can choose either chicken breasts or chicken thighs, but I tend to use boneless, skinless chicken thighs for the highest protein, lowest fat options when meal prepping. They’re just a great protein for weight loss and a healthy lifestyle. I’m all about saving time and being as efficient as possible, especially when I’m cooking. That’s why I love meal prep. Prepping out your meals in bulk takes far less time than cooking every meal from scratch every day. 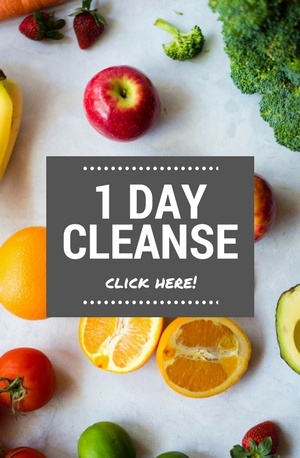 Shoot – it even saves more time than going out to restaurants every day. Also, you know you have something delicious and healthy waiting for you in the fridge so ordering takeout for dinner won’t even cross your mind. 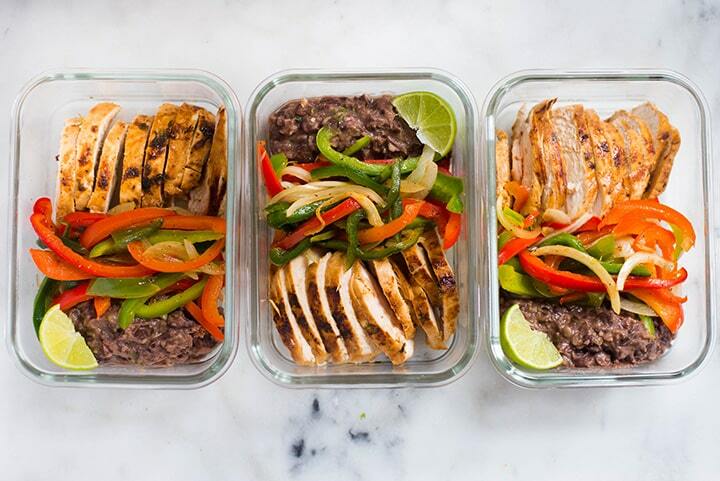 Chicken meal prep is a great way for you to make sure you eat nutritious meals throughout the week. Chicken keeps very well in the fridge, which makes it ideal for meal prep. To add some variety, use different cooking techniques when making chicken meal prep and play around with side dishes and different pairings. From healthy sandwiches, salads, wraps, to one of my personal favorites – Healthy Chicken Fajitas! 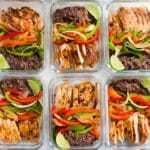 WHAT GOES ON HEALTHY CHICKEN MEAL PREP? I usually opt for boneless, skinless chicken breasts instead of chicken thighs for my chicken meal prep. 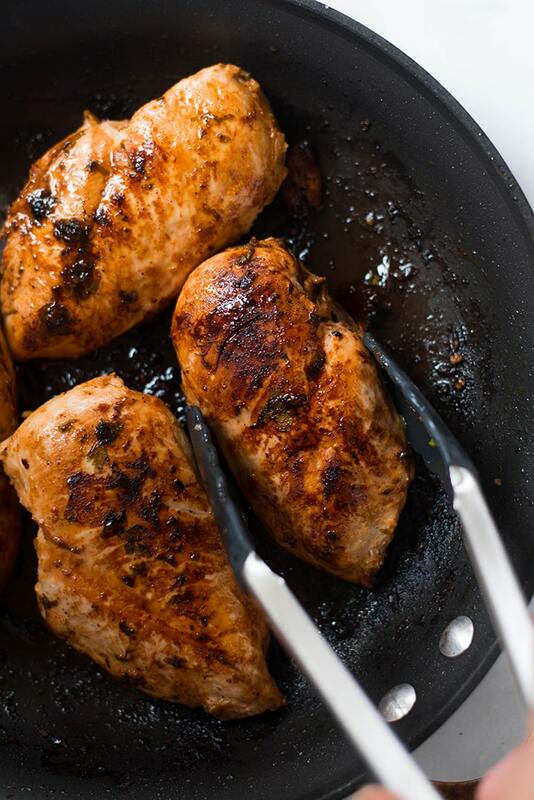 If you’re trying to stick to your healthy eating plan, chicken breast is definitely one of the best and healthiest protein sources you can add to your diet. Thankfully, being low in calories and fat does not mean it’s lacking in flavor. 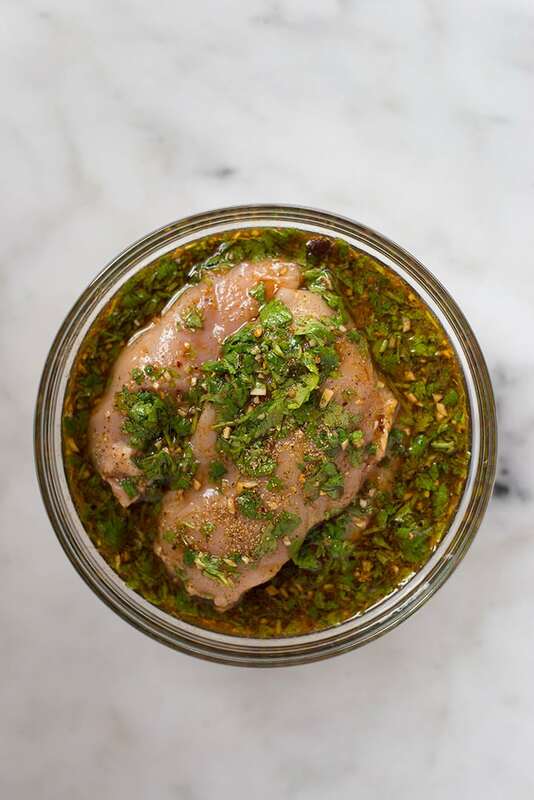 To add additional zest, try out different marinades to infuse your chicken with flavor. HOW LONG CAN YOU KEEP COOKED CHICKEN? Wondering how long it’s safe to keep cooked chicken in the fridge? How long chicken will last in your fridge really depends on how you store it. When stored in the refrigerator in an air-tight container, cooked chicken can easily last up to 4-6 days, which makes chicken a great choice for your meal prep. I use mason jars and these glass meal prep containers to keep my food fresh and safe, but any airtight containers will work. 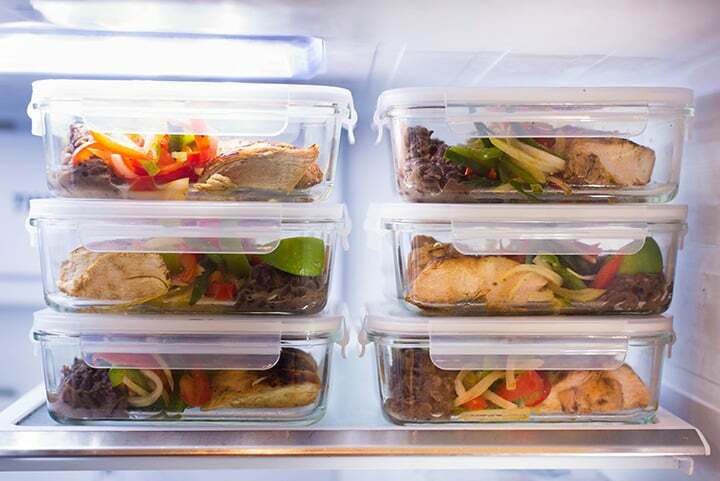 If you plan to start meal prepping often, investing in some storage containers to keep your food fresh will not only save you space in your fridge, it will also save you money since you won’t have your food go bad too soon. Who doesn’t love tortillas, am I right? 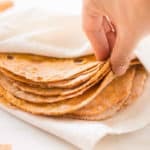 To make sure even my tortillas are super-healthy, I always choose whole grain or vegetable tortillas over plain ones. Put in a little extra effort and follow one of my easy homemade tortilla recipes, like this 4 Ingredient Spinach Tortilla recipe or learn how to make Homemade Corn Tortillas, and you;ve got yourself a tasty tortilla recipe to accompany your healthy chicken fajitas, if you want! These Chicken Fajitas are packed with nutritious ingredients, lean protein, and fiber. That means they’re not only good for your body, but also that you’ll feel satisfied and full for a long time after your meal, thanks to the protein, healthy fats, and fiber. We’re also keeping our sodium intake in check by choosing low sodium black beans, low sodium chicken broth and low sodium soy sauce. Just clean, whole ingredients for maximum flavor. 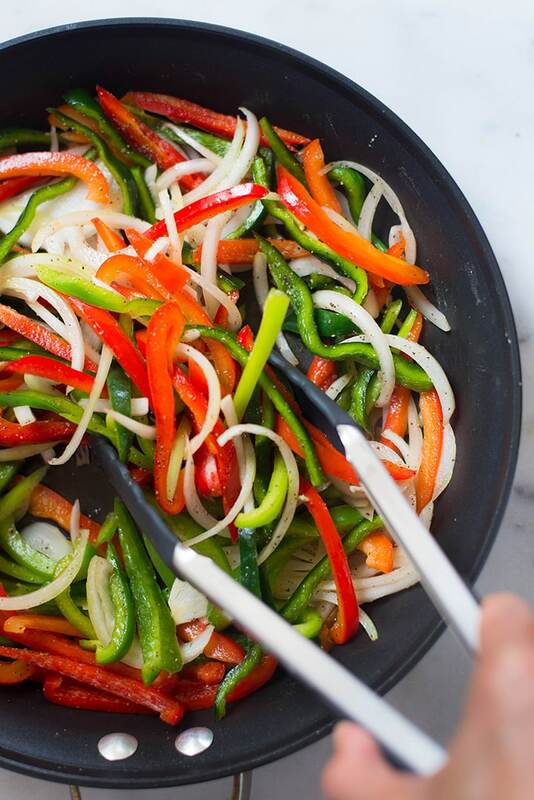 It’s actually pretty easy to make chicken fajitas healthy. 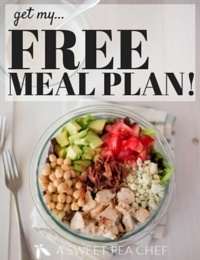 You can store these SEVEN meals in the fridge in an airtight container for up to 5-7 days. I use these glass meal prep containers to keep my food fresh and safe, but any airtight containers will work. When you’re ready to enjoy your meal, just reheat it in the microwave for 2 minutes and you’re good to go. This delicious and easy Healthy Chicken Fajitas Meal Prep is a low carb, high protein, and high fiber chicken meal prep recipe you’re gonna love. Bonus: this chicken meal prep is just 455 calories and is a great meal prep on a budget since each serving costs just $3.37! 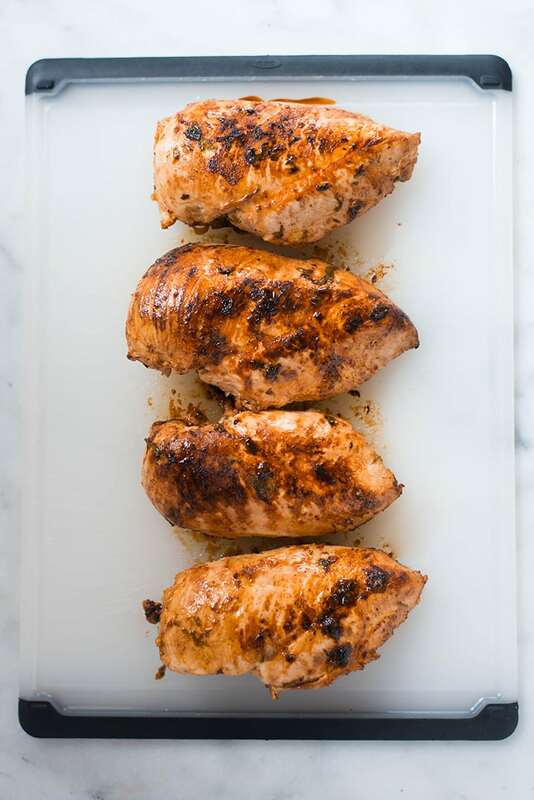 In a large bowl or ziplock bag, combine the chicken breast with freshly squeezed lime juice, no sugar added pineapple juice, low sodium soy sauce, olive oil, minced garlic, ground cumin, smoked paprika, red pepper flakes, sea salt, ground black pepper, and chopped fresh cilantro. Place in the fridge for a minimum of 30 minutes, up to 8 hours. Once the chicken is marinated, heat 1 tbsp. olive oil over medium-high heat in a large skillet until hot. Add the marinated chicken, cooking on both sides until cooked through, about 4-6 minutes per side. Remove the chicken from the pan and set aside to rest. Slice into thin slices. In the same pan used to cook the chicken, add sliced white onion, sliced poblano pepper, sliced red bell peppers, sliced green bell pepper, sea salt, and ground black pepper, and toss to combine. Cook over medium-high heat until the bell peppers and onion are tender, about 4-6 minutes. Add garlic, jalapeño, and cumin and cook for 1 minute, or until garlic is fragrant. Add the beans and broth and cook 5 minutes, stirring occasionally. 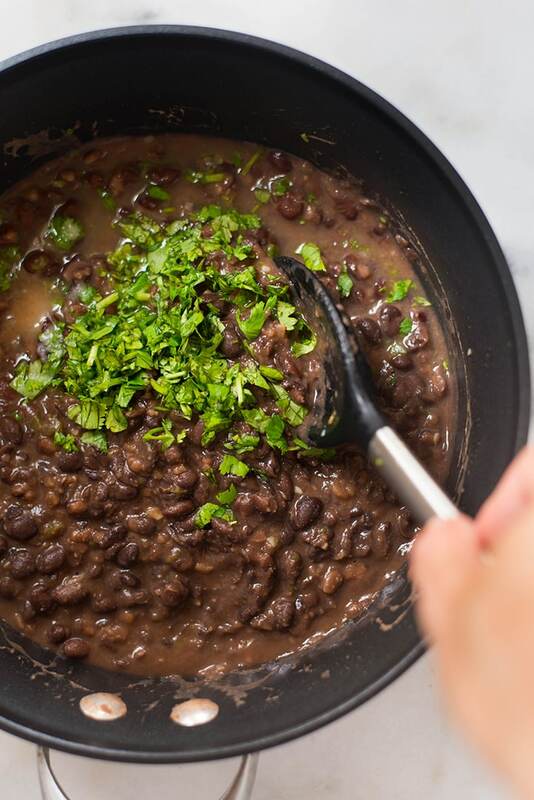 Coarsely mash beans with a potato masher. Continue to cook at a simmer for about 8-10 minutes until the mixture is thick, stirring frequently. Add in lime juice, cilantro, and sea salt, to taste. 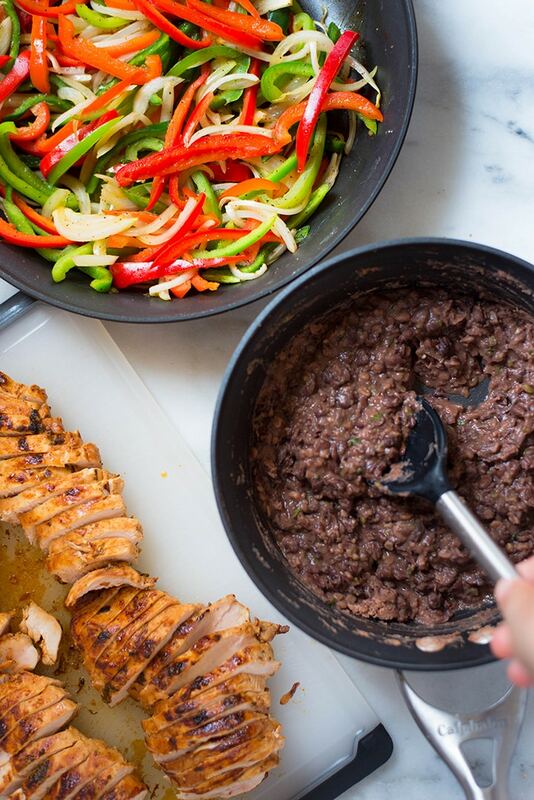 To assemble the chicken fajita meal prep, start by adding the cilantro lime black beans to your meal prep container, followed by the sliced fajita chicken, and the bell pepper and onion mixture. Actual serving sizes would be a big help. 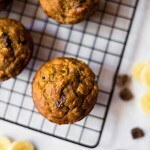 Wonderful taste and real easy to make. Hello, Thanks for this nice recipe guide. Will it be ok if I serve the recipe with some fried chicken to my guests?